American statesman, astronomer, scholar and inventor who wrote the Declaration of Independence (1776) and organized the Lewis and Clark expedition (1803). His only full-length book, Notes on the State of Virginia contains an outline of the geography, flora and fauna of Virginia, and established his reputation as a scholar and a pioneering American scientist. While serving as the U.S. President (1801–1809), Thomas Jefferson reflected on his abiding enthusiasm for natural history in a letter to Caspar Wistar. Jefferson began the letter, dated 21 Jun 1807, by complimenting the city of Philadephia (where Wistar was a physician and professor of anatomy), for having good facilities to teach his oldest grandson. (The fifteen-year-old teenager, Thomas Jefferson Randolph, was the second child of his daughter, Martha Jefferson and her husband Thomas Mann Randolph, Jr.) Thomas Jefferson was taking “a lively interest” in his education. “We propose, therefore, to send him to Philadelphia to attend the schools of Botany, Natural History, Anatomy, and perhaps Surgery; but not of Medicine.” Then Jefferson revealed that although he respected the study of anatomy, he was sceptical of the practice of medicine with its potions and purgatives. 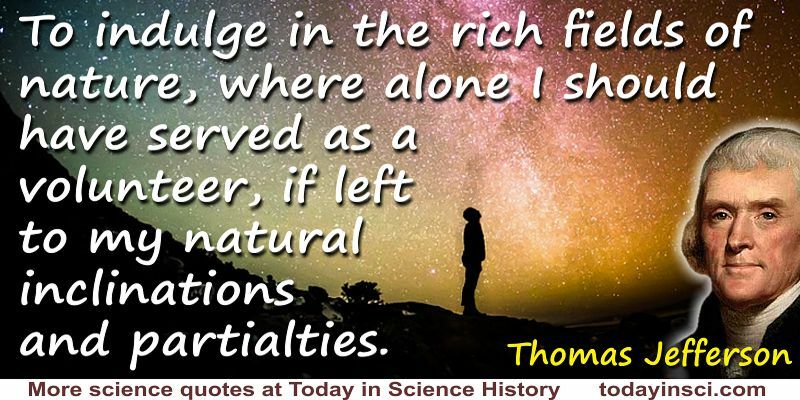 Science Quotes by Thomas Jefferson. 13 Apr - short biography, births, deaths and events on date of Jefferson's birth. Jefferson As A Man Of Science - Preface to The Writings of Thomas Jefferson, Vol. 19. Thomas Jefferson on Education and Science from a report on establishing the University of Virginia (1818). Thomas Jefferson: Scientist, by Edwin Thomas Martin. - book suggestion.